Blue Ridge Energy President Kenneth Greene presents the Director Gold credential from NRECA to Director Jeff Joines of Caldwell County. 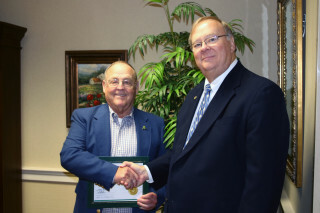 Jeff Joines, of Caldwell County, recently earned the Director Gold credential from the National Rural Electric Cooperative Association (NRECA) as part of his service on the Board of Directors for Blue Ridge Electric Membership Corporation. Joines is vice president of the Board.